Please call owner Ron at 605-376-2834. Boat Location: Big Lake, Minnesota. **Note: I am very motivated to sell this boat, since I recently relocated from South Dakota to Minnesota and only have about 1/2 of the storage I had at my former location. I am currently renting storage units and they are very expensive! So.., if you have any interest in this super nice Howard Customs Boat, and are a serious buyer, please give me a call..!! (I also might consider a trade and cash, but it can't be a vehicle unless it would be very easy to sell right away, since a vehicle does not gain me much storage room over the boat). 2000 HOWARD CUSTOM BOATS - (Howard 22 Sport). Nobody Does Performance Better Than Howard Custom Boats. 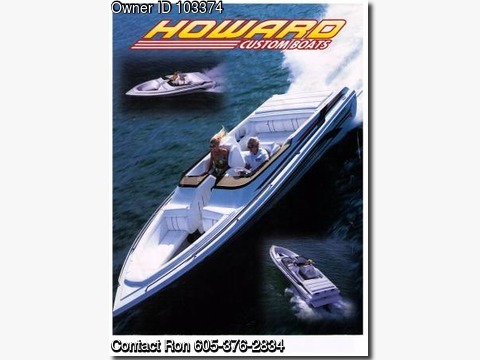 Howard Custom Boats have been building performance watercraft specifically to the tastes of boaters since 1959. Offering powerboats based on a v-shaped and catamaran hull style, the vessels created by Howard Custom Boats come in bow rider as well as cuddy cabin layouts. Powerboats produced at the 25,000 square-foot Howard Custom Boats manufacturing facility are constructed with only the highest quality materials. Every Howard Custom Boats vessel undergoes a water test to insure customer satisfaction. This Howard 22 Sport is literally like new yet. It has been stored in a Climate Controlled Environment its entire life, has had impeccable care, and has less than 150 hours on it. All Howard Custom Boats are spec-built in Valencia, California and have only the best components used in their engineering and design. HOWARD 22 SPORT: Featuring an all new modified vee hull with variable degree deadrise and reverse chines, this Sportster was designed for the discriminating boater who demands nothing but the finest, regardless of size. The large cockpit and spacious open bow area make this the roomiest bowrider in its class. The unique bottom design incorporates a small step in the center portion of the hull along with a long narrow keel pad, thereby providing a flat stable platform giving you a safe and exhilarating experience. Ideally suited for lakes and protected waterways, this boat will carry 12 passengers in comfort, pull water skiers all day (on a minimum of fuel), and still run 60 mph with the Inboard 385 Horsepower MerCruiser 5.7 Litre V8. Its clean, sleek lines coupled with superb performance and handling, make this the perfect sportboat for the new millennium. CONSTRUCTION: This HOWARD 22 SPORT is constructed utilizing only the finest materials available. It all starts with vinyl-ester resin and Knytex knitted Bi and Tri directional glass fabric. The entire hull is then cored with Baltek foam reinforcement. The hull and deck are joined together with Knytex 1708 Bi- directional glass fabric. The floors are molded one piece (Balsa cored) fiberglass. The seat bases, front and rear, are molded fiberglass, as is the sundeck. All stringers, bulkheads, floors and fuel tanks are installed while still in the mold to insure a perfect fit. Like all Howard's, the mold cure time is two weeks to insure proper curing and strength with no distortion. All hardware is Grade A aircraft quality stainless steel. Howard's absolute insistence on quality and meticulous attention to detail has produced the finest sportboat available. SPECIFICATIONS: (a short list...) *Length - 22 Foot 4 Inches *Beam - 96 Inches *Freeboard - 30 Inches *Approximate Weight - 3150 Pounds *Fuel Capacity - 60 Gallons *Bottom Configuration - 18.5 Degree Vee *Seating Capacity - 12 *Engine - 5.7 Inboard FI MerCruiser (385 Horse) *Propulsion Mechanism - Outboard Stern Drive. STANDARD EQUIPMENT: *Full Faria Instrumentation (tach, speedometer, volt meter, fuel gauge, water temperature, oil pressure, trim gauge) *100% Hand Laminated Fiberglass Construction w/Baltek Foam Reinforcement *Bi & Tri Directional Glass *Vinyl Ester Resin *4 Full Length Laminated Plywood Stringers *Marine Grade Plywood *7 Color Custom Gel Coat *All Stainless Steel Hardware and Fasteners *Heavy Duty Marine Battery w/Battery Box *Anodized Grab Handles w/Vents *Anodized Fuel Fills *Anodized Ski Tow *Anodized Gauge Bezels *Anodized Aluminum Rub Rail w/Rubber Insert *Many Built-in Storage Compartments *Illuminated Rocker Switches *Interior Lights *Built-in Ice Chest *Swim Step *Custom Color Coordinated Genuine Naugahyde Interiors *Plush, 40 Oz Marine Grade Carpet *Electric Engine Hatch Lift *Stainless Bow Rails *2 Piece Windshield *Bilge Pump and Blower Fan *International Navigation Lights *Dino Steering Wheel *Power Steering and Power Trim *CD Player Water Protection Cover (smoked). UPGRADES ON THIS HOWARD 22 SPORT: *Fireboy Automatic Fire Extinguisher (Clean Agent FE-241 - Coast Guard Approved) *Pioneer DEH-P6500 CD Player (Synthesizer, Mosfet 50W+4, CD-R, and more...) *Coustic 268/u Power Logic Amplifier (4 channel, Multi-Function) *Hummingbird HDR-600 Depthsounder *Stainless Steel 4 Blade Propeller *Optima Blue Top Dual Batteries (brand new) *And, more items. FINALLY THERE ARE OTHER ITEMS INCLUDED WITH THIS BOAT AS WELL, (including the following...) *Bimini Cover, (White with Folding Aluminum Framework) *Cloth Boat Cover (with Tie Straps) *Ski Ropes *Multiple Life Jackets *Anchor (with rope) *Dock Rope *And, even more items. **NOTE: This Howard 22 Sport had an original MSRP of approximately $65,000 with the accessories and equipment that have been installed. MY PRICE: Less than 1/2 of Original Cost and literally like new yet - that's a sweet deal..!! Anyway, give me a call if you are interested..!! You can also view this boat at ronsradrides.com. Just go to the website and click on the 00 HOWARD CUSTOMS BOAT on the right side of the home page and you will be able to view 41 high resolution, up close photos of the boat. And, you can choose to view them in a slide show format if you desire. Looking forward to hearing from you..! !